Award nomination and a giveaway! It’s great to close out the year on a note like this. Click the badge to take you to the poll, if you are so inclined (in case you forget, it’s under ‘Best Debut’)! I’m happy simply to be nominated; I didn’t expect it and it’s a really awesome thing for my first book, especially considering the company I’m keeping. Next up: the long-promised giveaway. 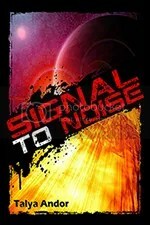 I will send a signed copy of Signal to Noise anywhere, with a personalized greeting of your choice. 1. The giveaway is open to sign up through Tuesday, January 15th at midnight Pacific time. 2. Sign up by commenting here on my blog entry. Include your name or a pseudonym, and your email so that I can contact you if you win. Your email needs to be accurate so that I can get in contact with you for a shipping address for the book! – Edited to add another category: Goodreads! If you are following me as a fan on Goodreads, you get another entry. Annnnd you’d need to tell me your name on there too. I will count your name once for a comment here, and an additional time for each follow. On Wednesday after the sign-up closes, I’ll put names in a spreadsheet and give the number range to a Random Number generator which will choose the winner. Thanks for reading, and happy New Year! Stay tuned for word on upcoming stories, and I’ve got stories to rec. ← From the Inside Out officially available to purchase. So I’m following your wordpress blog by email (hexen.hasel@yahoo.ca), I follow you by twitter (hexenhasel), and by tumblr (lilacwitchtea). Also following on Twitter (@goldensunangel) and Goodreads (Sabrena). Me me me me me me me! Tis Gaja! gajastar AT gmail DOOOOT com. Me, please! I’m following through twitter (@dusty273) and goodreads (Ana Maribel Cardenas) and my e-mail is anamaribelcardenas at yahoo dot com. Thankee! That’s three entries for Ana! Thank you, m’dear. Amatsubu here…Tygati got me hooked and I’m loving things so far!!!! Also, following on Twitter @ (falling_rain). And I also follow you here now too. I’ve refreshed my list of followers about five times and I don’t see you on it! I’ll add another entry for you if we get it sorted out, of course. What the heck, that was two days ago! Yes, dreaminginfinity is the right blog. *refreshes followers again* …OHHHHH, you’re on the list of email followers, not wordpress users. *smacks forehead* Okay, glad I saw that tab. That’s an additional entry for Rose! But I even got the confirmation email when I started following….well, in any case, I just tried to do it again. Am I following the right one? Is it this one? dreaminginfinity? YAY! Following your tumblr too (kisforkarol). Email is zziegamp at bigpond dot com dot au. I’ve been reading your stuff since I was 15. Your writing is amazing. Yay! Thank you for entering, and following! 🙂 I appreciate the compliment, and good luck! Awesome, that’s three entries for you! 😀 Thank you and good luck! Your fan on Goodreads (as cecillemd), following you on twitter as @freifallen. Excellent, that’s three entries for Cecille! Thank you so much. 🙂 The LJ isn’t associated with my author profile, haha, otherwise I would’ve. Thanks and good luck! Awesome, that’s three entries for Zuzana! Thank you m’dear, and good luck! Great, that’s two entries for Jo! Thank you, I appreciate it. 🙂 And good luck! I am also a fan of yours on Goodreads; Kim82 is my username but I’m under Kimberley Hess on there. Great, that’s three entries for Kim! Thank you so much. 😀 I appreciate it, and good luck with the giveaway. Excuse me, four entries! Sorry for the slip. First congrats on the nomination! Then, thanks for this giveaway. I follow your blog, I follow you on twitter (@Sopi_), I follow you on tumblr (TomAddict). Thank you for the congrats! The giveaway is my pleasure. 😉 Okay, that’s four entries for Sophie, good luck! Thanks so much! 😀 That’s four entries for Rachel, good luck with the giveaway. Aw, the Christmas fic was my pleasure, glad you enjoyed it. I added a fifth entry for you because it looks like you’re following my blog via email, too. 😀 Good luck! As for the entries: I’m following you on Twitter (@Maiwen), follow your blog, am a friend and fan on Goodreads (Carol Farley), following your tumblr (regensiemichan), and following this blog (regensiemichan). My email is i_walk_under_clouds_of_gray@yahoo.com for everything. Awesome, that’s five entries for Maiwen! 😀 Thank you, and good luck with the giveaway! For following; I have this blog in my favorites and I’m following you also in twitter (@Dewdrop_89). I also love to read your stories on THF. You have amazing writing style that captivates me every time. Thank you, Kastis! I have you down for two entries. I can’t see you on my list of WordPress or email followers, but I can add another entry if we get that cleared up. 🙂 I appreciate the congrats, and good luck with the giveaway! Thank you, Kay! I’ve got you down for two entries. 😀 Good luck with the giveaway! You know where I’m following you with Tumblr, Twitter, LJ etc. Congratulations, you deserve every kudo you get and then some. Thanks for your congrats! 😀 That’s two entries for Vivian, good luck with the giveaway! It’s my pleasure! I’ve got you down for three entries, Marie, and good luck! Congrats on the nomination and thanks for this giveaway! Real books, always exciting, I’m in. Awesome! Can I get an email from you, or I could comment here if you win? Added an entry for you, Sue! Can I get an email from you, or should I comment here if you win? HI!! This is Ashespashes, I’d like to be added to the contest. Good thing you tweeted to remind everyone about it. I added you on tumblr, goodreads, I’m following your blog, and twitter. I’m Ashespashes most places. Good reads is amountcastle1@yahoo.com, but don’t email me there. So excited about all of your upcoming books and I can’t wait to read them! Hi Ashes! I’ve got you down for four entries – I don’t see you following the blog on WordPress or email, but if we get that cleared up I can add another entry for you. 😀 Thanks and good luck with the giveaway! I’m so excited for what’s coming out this year. Fixed it.I confirmed in my email, then I had to confirm again on the site. Awesome, thank you! 😀 I’ve got you down for five entries. Good luck! Congrats! I’m so proud of you! This was always my favorite of your stories, so I’m glad it’s getting great reviews/feedback. Followed you on twitter, tumblr, and here – and commented, of course. Snowstormskies as the username. Such a shock, I know 😛 snowstormskies@googlemail.com is the email. 😀 Congrats on your noveling though – it’s really going well by the looks of it! Awesome, that’s four entries for you! 😀 It’s been going really well, I’m very pleased thus far. Thank you! Thank you so much! I don’t think it’s possible, but it’s an honor just to be nominated. 😀 Good luck with the giveaway!